Korean pottery masters in Icheon have long been working to revive an art that flourished over 5,000 years ago in the Korean peninsula. The city contacted the American Museum of Ceramic Art (AMOCA) in 2013 in order to share some of their new treasures with the rest of the world. The artists hoped that in doing so they might be able to promote these arts, which have sadly been largely ignored by modern artisans. Technology has constantly changed the way that ceramics are made. However, the pieces the city shared with AMOCA aren’t made with modern engineering in mind. They’re supposed to instead preserve the tradition of simplicity and temperance that Korean artists once always stood by. Korean celadon pieces were once revered, and they fetched large sums in many parts of the world throughout recorded history. Glazing techniques originated in China, but they were brought to Korea by ceramists working in the Goryeo period. These artists eventually added their own techniques, which featured delicate designs inlaid directly on the surface. These techniques were forgotten about during Japanese occupation of the Korean peninsula, and they were largely replaced with modern engineering. Opulent Goryeo celadon had already been replaced by austere designed that were preferred by buyers during the Joseon Dynasty. Even these simple designs were forgotten about by the early 20th century. Industrial pottery took over the entire market. Few Korean artists had any background in these ceramic techniques until around 1958. Publications about Goryeo celadon became available around that time, and the political climate made it possible for artists to return to a life of artistic experimentation. These artists laid the groundwork for modern celadon. Pieces often feature a sort of latticework that appears to be made from cracks. Photographs never seem to do these cracks justice. It’s something that needs to be seen to appreciate. The AMOCA exhibition in October 2013 helped to promote the cause of Korean pottery masters in the United States. 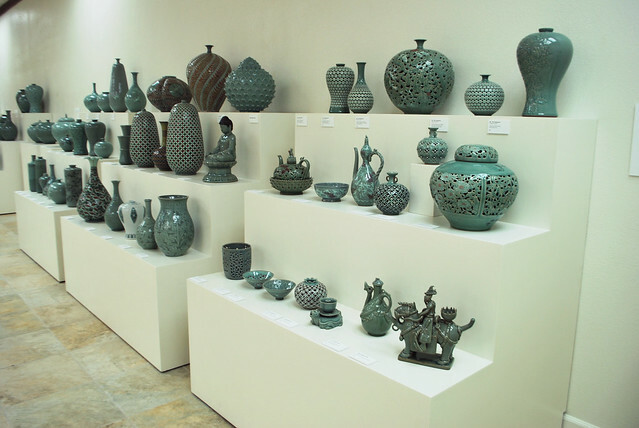 Over 180 different pieces of traditional Korean pottery made their way to Pasadena for the exhibition. Some of the pieces were actually up for sale as well. No other similar exhibitions are currently planned, but the appetites of American art fans have already been whet by this showing. That might very well translate into a truly international revival.